Rachel grew up immersed in the outdoor scene here in the Pacific Northwest. Backpacking, hunting and rafting the local rivers. Even though she spent hours in the off trail depths of the forest, she didn’t pay attention to mushrooms until after college. When out foraging for huckleberries (with no success) a friend began to tell her about mushrooms, she went home that day with a hat full of Chanterelles and an inspired curiosity. Since then, that curiosity has fruited into an in-depth passion and knowledge of the world of mushrooms. Rachel teaches mushroom foraging workshops and lectures throughout the Pacific Northwest, is an active member of the Oregon Mycological Society, she runs a small but resourceful blog/website that addresses the most frequently asked questions from those aspiring to learn more about mushrooms, has a YouTube page that feature how to identify key edible mushrooms and other fungi facts and is currently working on her first mushroom handbook along side Roost Publishing. 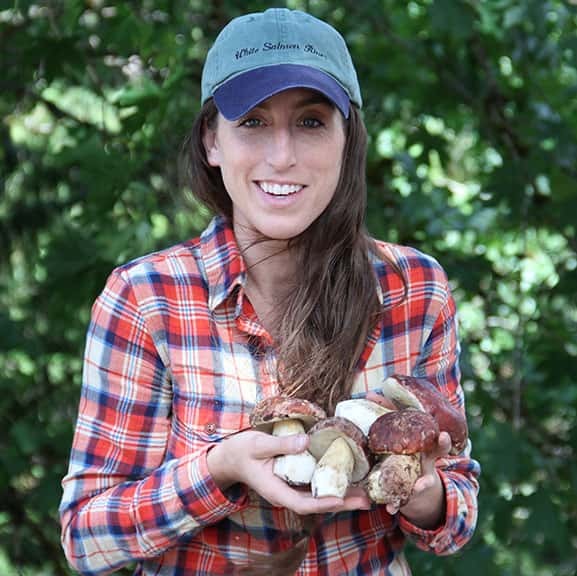 Even when it isn’t prime mushroom picking season, you’ll find her outside, most likely lying in the mud with her two young boys in tow, photographing the beautiful life of mushrooms.